The remark was naturally meant to be said in confidence, but the two leaders' microphones were accidently left on, making the would-be private comment embarrassingly public. The communication faux pas went unnoticed for several minutes, during which the conversation between the two heads of state – which quickly reverted to other matters – was all but open to members the press, who were still in possession of headsets provided by the Elysée for the sake of simultaneous translation during the G20 press conference. "By the time the (media) services at the Elysée realize it, it was on for at least three minutes," one journalist told the website. Still, he said that reporters "did not have a chance to take advantage of this fluke." The surprising lack of coverage may be explained by a report alleging that journalists present at the event were requested to sign an agreement to keep mum on the embarrassing comments. A Reuters reporter was among the journalists present and can confirm the veracity of the comments. A member of the media confirmed Monday that "there were discussions between journalists and they agreed not to publish the comments due to the sensitivity of the issue." He added that while it was annoying to have to refrain from publishing the information, the journalists are subject to precise rules of conduct. 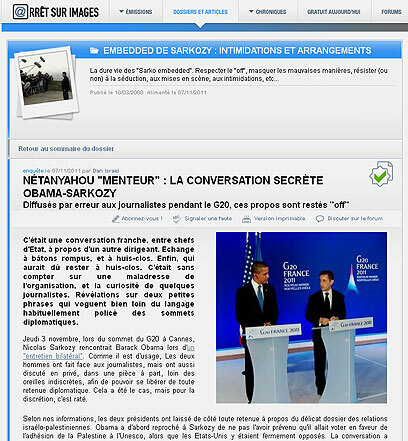 See all talkbacks "Report: Sarkozy calls Netanyahu 'liar' "